The Lake Joondalup Lifestyle Village choirmaster was well known in the northern suburbs, performing at citizenship ceremonies, nursing homes, Anzac Day and Remembrance Day ceremonies, Carols by Candlelight and the annual village concert. He would spend hours researching and arranging music for the choir and teaching them over 50 new songs each year. 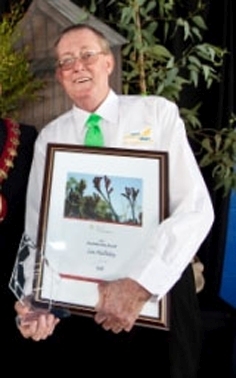 In 2011, he was presented the City of Wanneroo Australia Day Award. Cr Dot Newton said she had been involved with Mr Halliday through the Wanneroo Council and the Carols by Candlelight events she had organised over the past few years. ‘He was a warm, friendly, talented individual who doted on his grandsons and enjoyed entertaining people less fortunate while raising money for the Carson Street School and many other charities,’ she said. ‘He was very much a community guy,’ she said.